Alternate Post Title: Q: Why is Jamie Not Wearing Underwear? A: Because Pat's Are Dirty. I am pleased to say that I was able to use this blog title before Craig did. That's what he gets for beating me in Scrabble on the drive home from Vegas. So, Blog, would you like an explanation on the underwear thing? I'll give you one, but it will prove that the adage, "What happens in Vegas, stays in Vegas" is (mostly) a lie. I went on a road trip to Las Vegas with my boys - Patrick, Jamie and Craig. It was a very, um, interesting trip. I have never discussed underwear so often in a three day time span. It started with Patrick forgetting to pack underwear. His proposed solution was to go to Target and buy some. Jamie's proposed solution was a show of solidarity amongst the boys where they would all boycott underwear for the whole trip. Jamie's show of solidarity ended up being an act of individualism, as 1) Craig wore his underwear the entire trip (I know this both because he said so and because of visual proof on more than one occasion) and 2) Pat did take us all to Target to buy his new underwear. I would like to note, for the record, that I did not get any visual proof of Jamie's claim to be underwearless. Thankfully, Jamie displayed more modesty than Craig and Pat. Don't worry, Blog, there was more to the trip than underwear, or lack thereof. 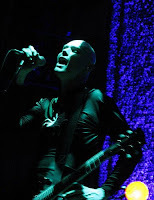 There was also the Smashing Pumpkins concert, which was the impetus for the whole trip. Jamie is a fan and since he did the Cure with me, I agreed to do the Pumpkins with him. Pat and Craig went to see a comedian while Jamie and I were at the concert. The concert was awesome! I had a great time - I was completely mesmerized for the entire show. There also was the meeting of Gordie Howe - Mr. Hockey. Jamie has an autograph collection that was missing Gordie, so we went and visited him at Field of Dreams, where old pros get paid to meet their fans and talk about being old. Pete Rose was there, too, but he didn't play hockey so who cares? Blog, I can tell you that there was some serious partying going on while we were in Sin City. Ok, maybe not serious partying, but there was some Scrabble playing. I won this game by a scant 4 points on the last play - MERL and ELL. Craig challenged, but merl is, in fact, a word. Blog, I know you are looking at the board below and saying that FISTY surely is not a word. Well, you're right - I was just too scared to challenge. As mentioned earlier, Craig beat me at the rematch on the drive home by about a zillion points. I tried to play TROUTING which was not a word and was an incredibly stupid play since I could have used TUTORING instead. Dumb. There was also the wonderful strangeness of having a lot of special treatment aimed at this little Diamond. I had my own entrance to a buffet and my own check-in lobby. Vegas knows I'm a super-star!! There was also some happy heel clicking - which may or may not have broken Jamie's foot. And, Blog, in case you are wondering, no, Craig cannot click twice in one jump despite some very valiant efforts. And you may have noticed, Blog, there was definitely LOTS of crotch-pointing. This is a Jamie specialty which Pat and Craig tried to emulate to varying degrees of success. Yeah, Craig is definitely not succeeding there, huh? Blog, did I just hear you say that perhaps Jamie has some maturing to do? This was a much debated topic on our trip and the unanimous decision was no, we like him the way he is. What exactly is that on Jaime's shirt? Did he get that faux airbrush shirt at a Wham concert?